Financial rating agency Standard & Poor's analyzed the cost of the partial government shutdown on the United States economy and found it added up to at least $6 billion — more expensive than the $5.7 billion President Donald Trump wanted for the border wall. In a report issued on Friday, titled, "U.S. Government Shutdown Ends, But At What Cost?" the rating agency's Global Economics arm said the overall cost to the economy — for the longest government shutdown in U.S. history — is "likely worse than what we had previously expected." Late Friday, Trump signed a bill officially reopening the federal government for three weeks while Congress further negotiates border security funding with the president. S&P previously estimated that the partial shutdown would have a "modest impact" on the U.S. economy, which is worth about $19 trillion, according to the agency. The rating agency previously estimated the U.S. economy would lose approximately $1.2 billion of real Gross Domestic Product (GDP) for each week of the political standoff. People hold placards during a rally to protest against the partial government shutdown at Federal Plaza in Chicago, Jan. 18, 2019. But, as the shutdown continued, "weekly costs likely widened beyond the average weekly cost of $1.2 billion," the agency said in a press release announcing the results. 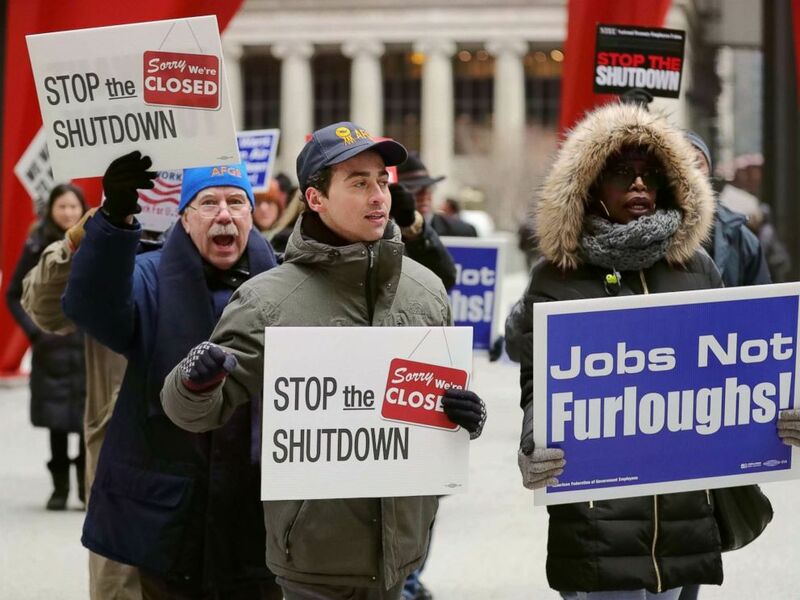 "Here, both direct costs, on lost productivity from furloughed government workers, and indirect costs, from lost economic activity to outside businesses because of the shutdown, amplified with each week the government remained closed," the statement continued. "We had expected that other indirect costs were likely just delayed, with businesses recouping some of those losses once the government reopens its doors. But, with a five-week closure, we suspect that more of those economic activities indirectly tied to the government may have been outright canceled," the statement said. The agency, like many affected government workers, expressed caution about the end of the shutdown. "Although this funding battle has ended, the next one starts in a few weeks, which may reduce growth expectations if businesses and financial markets begin to expect that Congress and the president will repeat the experience again and again," the statement said.